Photo: Bevel Craft Brewing Instagram. Two and a half years after announcing plans to open a brewery in Oregon, Nate and Valarie (Jenkins) Doss are closing in on its launch. 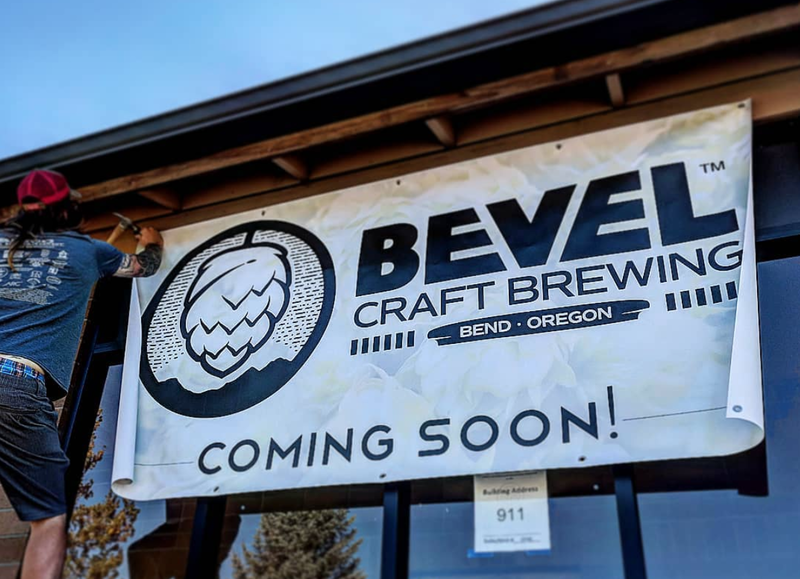 Bevel Craft Brewing is set to open next year in Bend, Oregon after the couple signed a lease on their facilities over the summer. We caught up with Valarie last week to see how things were coming along and what kinds of disc golf surprises are in store for those who stop into the taproom. UWDG: It’s clear from your Instagram that you’ve been hard at work getting the new brewery set up! How are things going and how far along are you? Valarie Doss: It has been an exciting and challenging ride for us. We never could have imagined all the work it would take to get this brewery up and running, and a total renovation to a 1930s building has been quite a project. We signed our lease in May and began demolition in June. For about two months, we found ourselves outside helping to dig holes to completely replace the sewer, gas, and power lines. We felt like this step of the process would never end, but thankfully we’ve completed that and have moved inside to shift our focus on our business. When do you plan to open the brewery? It is still not set in stone, but we hope to do our big grand opening in the spring when the weather gets nicer. We have an awesome patio, along with a courtyard where we’ll have four food trucks parked outside. We also have a hop garden in the back and room for a basket or two for putting games. We want to showcase everything we have to offer during our grand opening, so we’re hoping that April brings us some beautiful weather to make it all shine. We invite people to sign up for our newsletter to be the first to know about dates of our grand opening party. We already have some awesome ideas in store. How long will it take to go from getting the equipment all ready to go and having the first beer ready to serve? Our brewhouse was delivered on October 23rd, and our fermentors and serving tanks were delivered on November 13th to complete the whole system. Between those two dates, Nate has been working with our plumbers and electrician to get all the services ready to hook it up. Nate anticipated it would be about a month and a half before that all happens, including hooking up all the hard piping, the glycol system, and our wastewater system. We’re moving along on schedule and hope to be brewing our first beer in December. If that stays on schedule, we’ll have our first beer ready by the beginning of the year. What’s been the hardest part of the process so far? What about the most fun? We have chosen to be fully immersed in the project from start to finish, and it has been absolutely the most manual labor that we have all done in our lives. We keep joking that we’ve never been in better shape from digging ditches, heaving lava rock, and putting pavers down for the patio. We’re stronger, but that definitely didn’t come without a few days of feeling beat up. The most fun part of it all is seeing our project come to life each day. All of the hardworking and planning that we have done is paying off for us. Each day that we devote ourselves to this project, the more progress we see happen, and it’s so rewarding. We missed you for much of this year out on tour. Was it difficult to skip a lot of the big events in the later part of the season? It made us both sick to make the decision to pull out of the World Championships, and then soon to follow was the USWDGC and USDGC. At the same time of these tournaments, we knew we would be in the crunch time of preparing the brewery in anticipation for the brewhouse to arrive. It was the most responsible decision we could make for the future of our business and speeding up the road to opening. With so much on our plates at that time, it would have been so difficult to leave Oregon and travel literally as far away as possible within the US and try and compete for a World Championship title. Bevel is the most important thing in our lives, and we would have regretted leaving at such an integral time in its early life. How much disc golf do you see in your future once the brewery is up and running? In short, not much. We do hope to be involved in disc golf as much as possible, but we will be the main employees of the brewery, including our partner, Justin Celmer. Although we will be there full time for a good while, we will always be involved in this sport. It is what made us who we are, it brought us together, it allowed us to travel to breweries around the world, and it allowed us to get the support to open our dream. We do hope to still do a few collaboration brews for 2019, so keep an eye on our social media for that. Can you let us in on any secret disc golf specials or hidden menu items for when we stop by the taproom? The names of our beers will all give a nod to the sport. I am currently designing all the features of the taproom and am working on a couple light fixtures where I’ll be using an actual basket. We’ll have discs on the walls, some cool memorabilia including some of the first ever beveled edged discs in existence, and, of course, we will definitely have the biggest tournaments playing on the TVs in the taproom. Find out more on the Bevel Craft Brewing website. Comments on "Q&A With Valarie Jenkins: Bevel Craft Brewing, Missing Worlds, What’s Next"